Though their output was dwarfed by their male counterparts, talented 20th century Irish female artists pack a punch in the saleroom when their art does appear at auction. A 16 x 23in (40 x 59cm) oil on board of a Parisian-looking Dublin was one of two paintings at Adam’s by Norah McGuinness (1901-80). The County Derry-born painter was a key player in the modern movement in Ireland, her bold compositions and confident use of colour strongly influenced by her time in Paris. 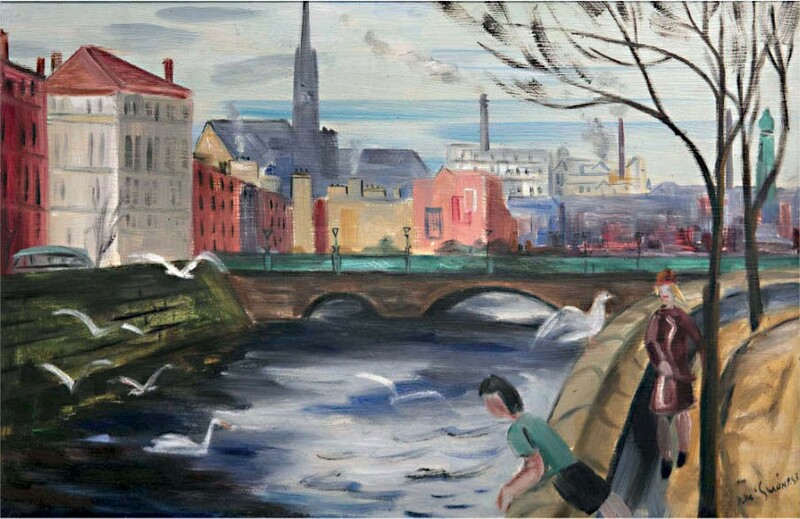 The Liffey belongs to a series of paintings McGuinness produced of the city of Dublin and its main artery in the late 1940s or early ‘50s. With a Victor Waddington Galleries label on the verso and not offered on the market since the early 1950s, it sold towards the upper guide at €14,000 (£12,280). Another 14 x 20in (36 x 51cm) oil on canvas titled Figure walking a path tipped over top estimate to sell for €12,000 (£10,530). The female contingent at Adam’s was led by an abstract composition by Mainie Jellett (1897-1944), another leading female modernist whose abstract creations were the first to be shown in Ireland. The 2ft 11in x 2ft 4in (91 x 71cm) oil on canvas, signed and dated 1925, sold above the €20,000- 30,000 guide for €39,000 (£34,210). Like McGuiness, Jellett drew a lot from her experience in Paris, particularly her encounter with Cubism through the French painter André Lhote. At Whyte’s, the stand-out entry was a small Impressionistic-style work by Grace Henry (1868-1953), Paul Henry’s first wife who was born in Scotland but spent a large part of her painting career in Ireland. 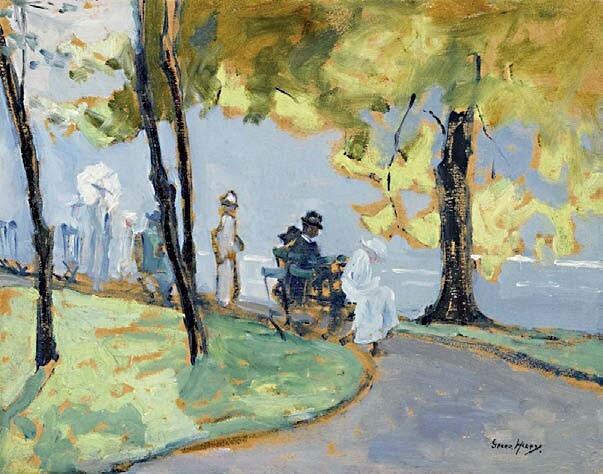 The 11 x 14in (28 x 36cm) oil on board of a sunny scene in a Dublin public garden went over the €4000-6000 guide to sell for €10,000 (£8770). Since her rediscovery in the 1970s, Henry’s works have held their own at auction, although her prices have yet to reach the heights of Jellett and McGuinness. Elsewhere at Whyte’s, Sarah Purser’s (1848-1943)An Important Letter from 1882 made a double-top-estimate €10,000 (£8770).